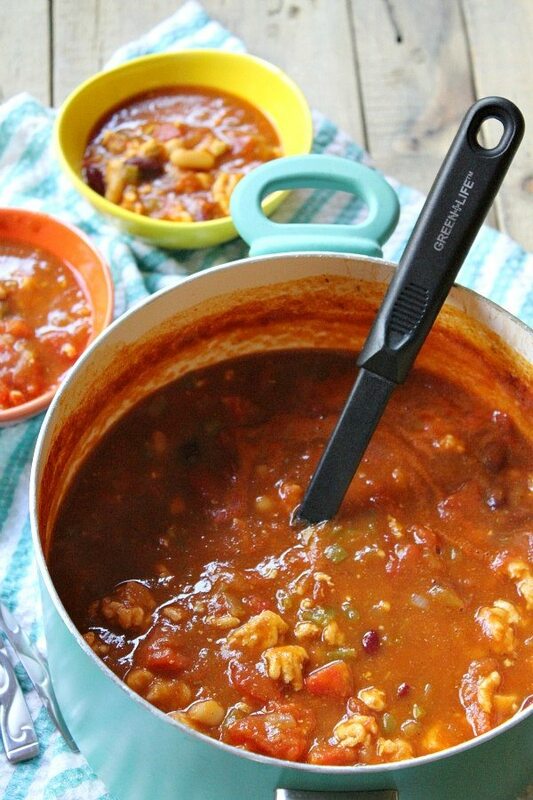 I’ve always loved this Turkey Pumpkin Chili recipe. It’s a good-for-you kind of chili. No guilt! I live in Arizona- where it doesn’t often get chilly outside. In fact, if you live outside of Arizona, you may think we have hot, sunny weather all year long! In fact, that is not true. We do get some cooler temperatures! Last night (January), temps dipped down into the 30’s. And there was a good layer of frost on our poolside lounge chairs this morning! This is quite a change in winter weather from when we lived in the Reno-Tahoe area, but I welcome that change for sure. In any case, the “warmer” winter weather we have here in Arizona still calls for some hot comfort food once in a while. 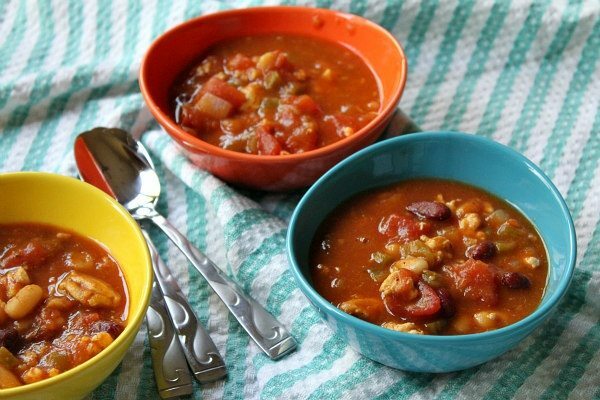 Chili is the perfect warm-you-up kind of meal. 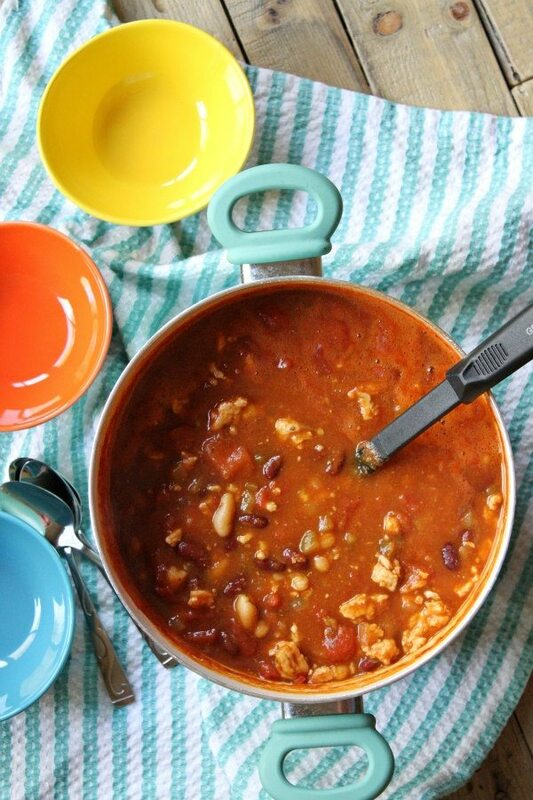 This Turkey Pumpkin Chili recipe is very easy to make. You can have the whole thing prepared in just 20 minutes, and then let it simmer for 30 to 60 minutes. 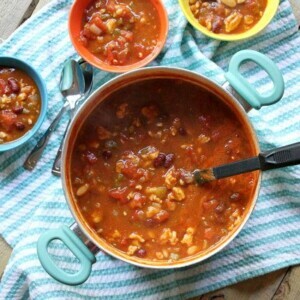 We sometimes serve this chili with shredded sharp cheddar sprinkled on top– melted and yummy! Sour cream and fresh cilantro are good additions too. If you’re following the Weight Watchers program, this chili computes to ZERO Freestyle SmartPoints. That’s a big win! I like to make a big batch of it to have for lunch all week long. Brown meat in large pot. Remove meat and place on paper towels to remove excess fat. Wipe any remaining fat from the pot and coat pot with cooking spray. Sauté onion, bell pepper and garlic; sauté until tender. Return meat to pot. Add all remaining ingredients and stir to combine. Simmer 30 minutes to 1 hour. If chili is too thick for you, add more water, and adjust seasonings as needed. 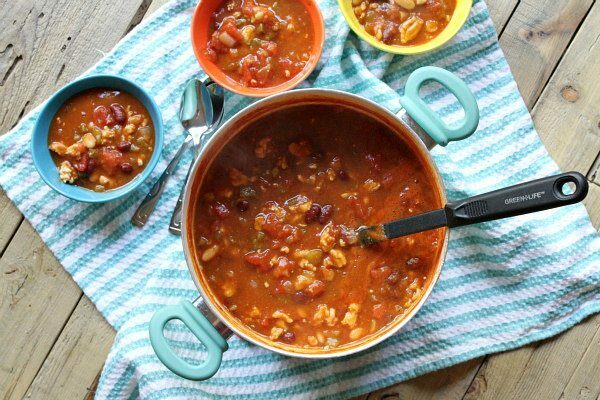 Serve up this chili with some Pumpkin Cornbread!